Sergej Rachmaninoff is a famous Russian composer, pianist, and conductor who had lived in Hertenstein, Weggis, Switzerland from 1932 to 1939. Sergei Vasilyevich Rachmaninoff was born on March 20, 1873 (New Style, April 1, 1873) in Semyonovo in north-western Russia, and died of melanoma on March 28, 1943 in Beverly Hills, California. He wanted to be buried at Villa Senar in Switzerland but due to World War II his request was not fulfilled. Villa Senar is a family-owned estate in Switzerland which was built by Sergej Rachmaninoff. It is located in Hertenstein, Weggis near Lake Lucerne. According to Wikipedia, the name of the estate was taken from Rachmaninoff’s and his wife’s names, and two of his major compositions were written in Senar until the family left Senar in 1939 at the outbreak of the World War II. The name of the estate originated from the names of Rachmaninoff and his wife: Sergei and Natalia, by combining the first two letters of each given name and the first of their surname. Two of Rachmaninoff’s major compositions were written in Senar: Rhapsody on a Theme of Paganini completed in 1934 and the Third symphony completed in 1936. Rachmaninoff left Senar for the last time on August 16, 1939. 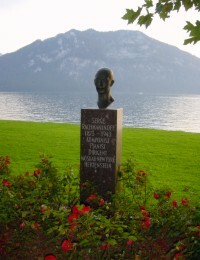 The monument was built in honor of Serge Rachmaninoff who had spent his summer with his family at Villa Senar in Hertenstein, Weggis, Switzerland from 1932 until 1939.